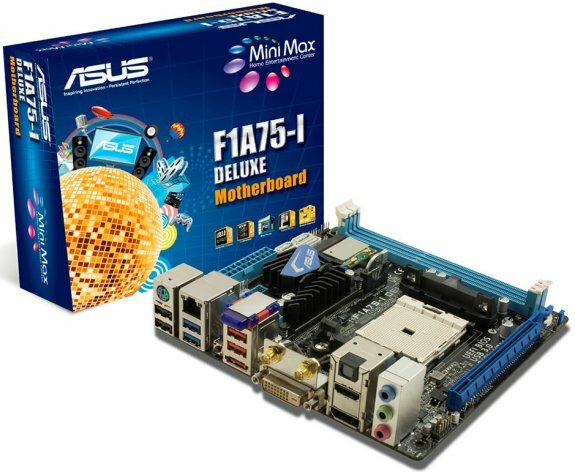 ASUS teases the F1A75-I Deluxe, an upcoming Mini-ITX motherboard for AMD's FM1 socket A-series Llano processors. More info at TPU. Pricing and availability is unknown. The lone expansion slot is a PCI-Express 2.0 x16, letting you plug in just about any PCIe addon card. Storage connectivity includes four SATA 6 Gb/s ports with RAID support, and one eSATA 6 Gb/s. Other connectivity features include 6-channel HD audio with optical SPDIF (our only gripe), four USB 3.0 ports (two on the rear panel, two by header), WiFi b/g/n, gigabit Ethernet, Bluetooth, and a number of USB 2.0 ports. Display connectivity includes one each of DVI, HDMI 1.4a, and DisplayPort 1.2. The HDMI 1.4a output includes 8-channel HD audio of the GPU, so the 6 analog audio channels is sort of compensated. The board features ASUS TPU performance control chip, EPU energy-efficiency chip, and a UEFI firmware with ASUS EZ-mode GUI setup program.